I was over at Rice yesterday for the El Anatsui gallery talk, and I used the opportunity to visit a couple of Jim Love sculptures. 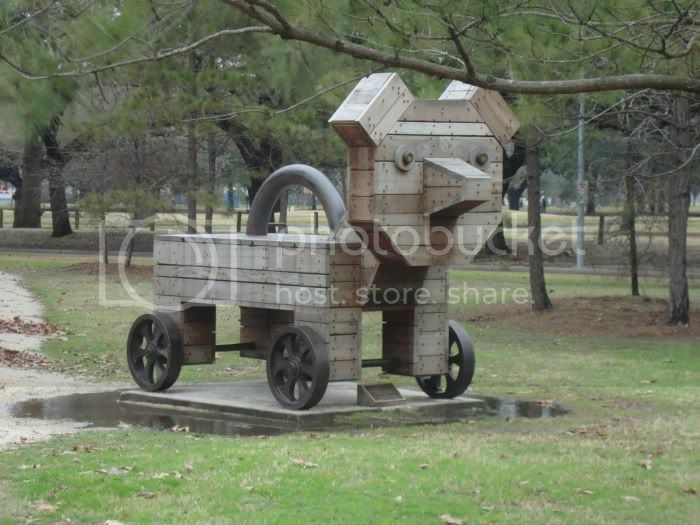 As I mentioned in an earlier post, Love was a Houston artist who built assemblage-style sculptures. "Paul Bunyan Bouquet" is a good example of this kind of work. 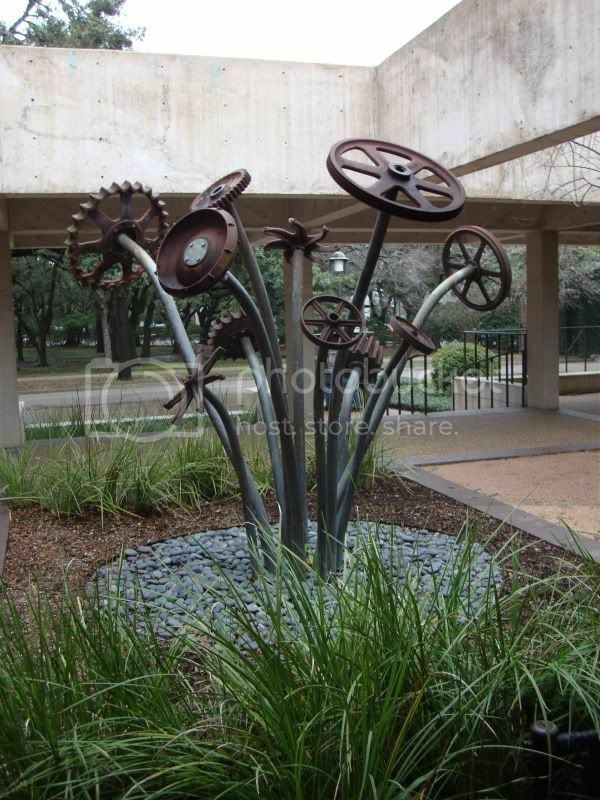 This is in the courtyard of Lovett College and has been there since the college was built in 1968 (as far as I know). I wonder if they include sculptures in the new colleges (Martell and the two new ones they are building now)? 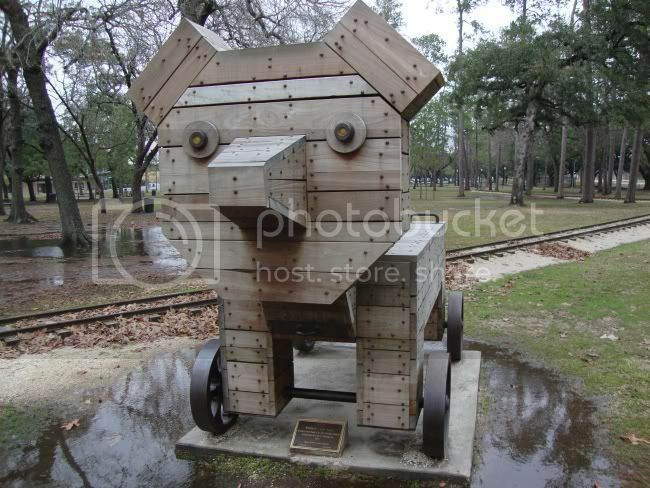 Over in Hermann Park is another playful Love piece, the "Portable Trojan Bear." 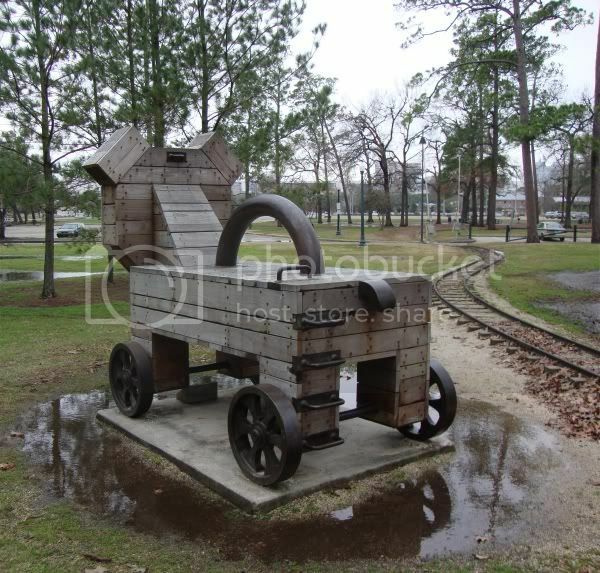 This is the perfect sculpture to put beside the miniature train in Hermann Park. It almost seems to have been made with kids in mind. The handles on the back are perfectly kid-sized. Back at Rice, I stopped by the new Recreation Center to check out "Lift," which was recently installed. First of all, I have to say that compared to the sweaty dungeon that was the gym when I was an undergrad, this gym is freaking amazing. The exercise equipment (in a big, high-ceilinged room surrounded by windows) was super high-tech, gleamingly new. 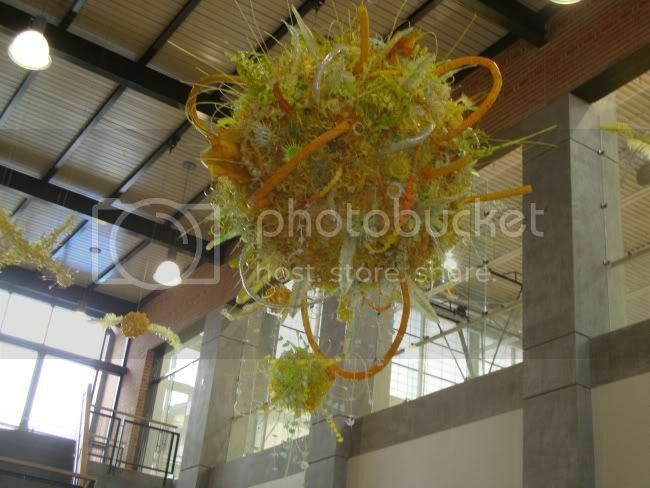 "Lift" is in the main foyer. You can see some photos of "Lift" being installed here. Here is what it looks like now. Here's a view from directly beneath the big ball. Unfortunately, I couldn't go up the stairs to take a looking-down shot. There is an ante-room kind of space open to the public, but to get further inside, you have to either be a Rice student, staffer, or have a membership in the gym. 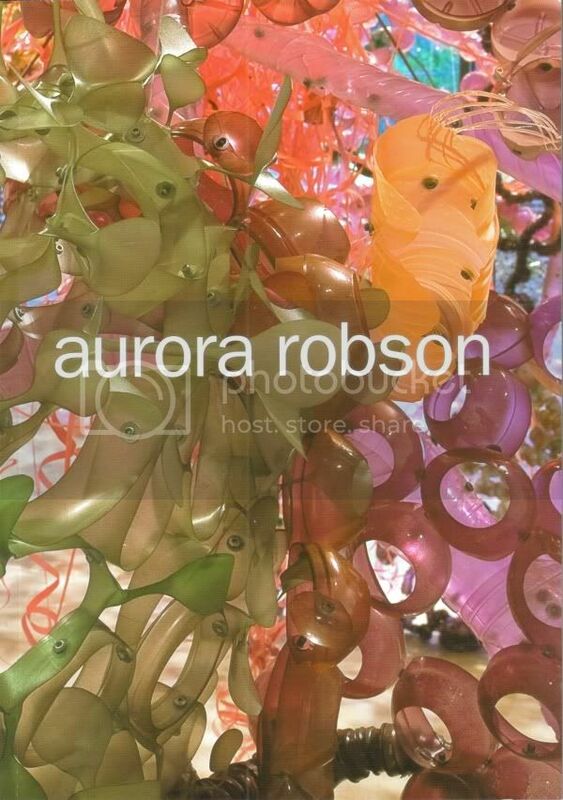 Aurora Robson did a temporary installation at the Rice Gallery in 2008. Didn't see it? Well, you're in luck. The Rice Gallery publishes heavily-illustrated little books (not quite monographs) on their installations, including one for Robson's installation. These always come out after the fact. I wanted to mention it because it's a publishing program that is really unknown to the wider world, as far as I can determine. And these books are really excellent. 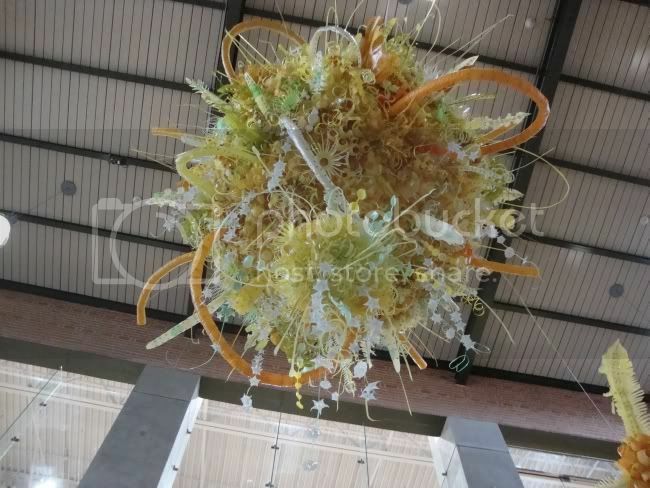 One last thought... "Paul Bunyan Bouquet," "Lift" and "Gli," the El Anatsui installation, were all made with trash--surplus industrial metal wheels and gears for the Jim Love piece, plastic bottles from the Robson piece, and metal liquor bottle tops for "Gli." I don't suggest any particular meaning here--it's just an interesting coincidence.